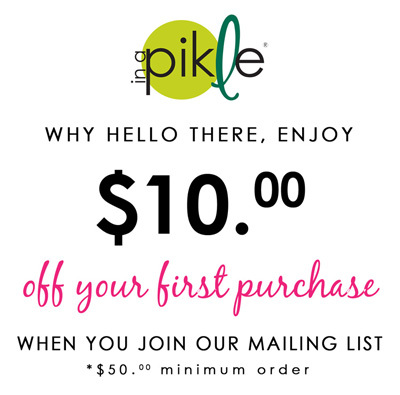 Have you ever met one of those people that are never “In A Pikle”? What about those who seem to always win the sweepstakes in life? Simply put, they’ve got all the luck! How do they do it? How does good fortune always seem to smile on them while the rest of us are left “Pikled”? Raise your hand if you “plan for the worst” and forget to “hope for the best”! We are all guilty of this from time to time. We are so busy planning for what negative outcomes could happen, usually through a worried outlook, that we do not focus our positive mental vibes on what we really want to have happen and can happen. Instead of dwelling on the “What’s the worst that can happen?” focus your thoughts and intentions on “What’s extraordinary experiences could be mine?”. Start “hoping for the best” more. Expect life to go your way and most of the time it will. When it doesn’t, be excited that your plans have just been challenged and now you get show this new experience who’s boss by raising your bar! Lucky you!!! I know it is hard to put yourself out there, because the fact is… things could definitely go south. But no one has an extraordinary life by being ordinary. When we really study those who appear to have a good luck charm, we noticed they actually have tried, tried and tried again only to have FAILED! When we are willing to fail, we eventually succeed. Just ask my neighbor who has the goal to win something on the radio once a month. Her winnings include, but are not limited to, amusement park passes and VIP section seats at all kinds of concerts! It’s amazing to see her regularly post on Facebook her latest win. At first glance you would think she’s the luckiest gal! And she is… but ask her and she’ll tell you she spends hours listening to the radio, writing down winning phrases, and ultimately making many failed attempts so she can be lucky. Someone has to win, and it might as well be you, so take chances! Put your hand up for what you want every time, without guilt if it doesn’t happen… another opportunity is right around the corner, promise. Being lucky sometimes simply comes down to your perspective. What may seem like really bad luck to some may be the best turn of events to another. Take for instance the man who parked his car in front of a corner store so he could run inside to grab a quick refreshment. When he emerged from the store, he was horrified to discover that his car had been completely totaled by a garbage truck. What would be your first thought? That the universe had it out for you and bad luck follows you and attacks at the most inconvenient time… and… and…? Well, hold those thoughts. Our story’s main character actually thinks, “Wow, I am so lucky I wasn’t in the car”. Wait… what? Yep, there is always going to be a silver lining and that is where luck resides. Look for it, recognize it and allow yourself to feel lucky not matter what the world throws at you! Spoiler… you are not an object that has to sit back and take it… throw “I’m Lucky!” right back in the world’s face. The Roman philosopher, Seneca, reminds us that we make our own luck, and thus it is all in your perspective. So the next time you think, “Boy, aren’t they lucky!” take a minute to remember how you too are lucky! For one thing, with your packed “Pikle” or “Bundle,” you are prepared to deal with “life’s little emergencies!” Ultimately, we agree with Stephen Leacock’s statement, “I am a great believer in luck, and I find the harder I work, the more I have of it.” We would add, sometimes luck does not look like our original goal, but that doesn’t decrease its value! IT’S WHAT’S INSIDE THAT COUNTS… Refill/Starter Pak! Organization… the key to sanity!